As I’m spending time with our new little one, some of my best blogging buds are covering for me. Today please welcome our old friend Kelly from Studio DIY! Oh hey! Kelly from Studio DIY here. 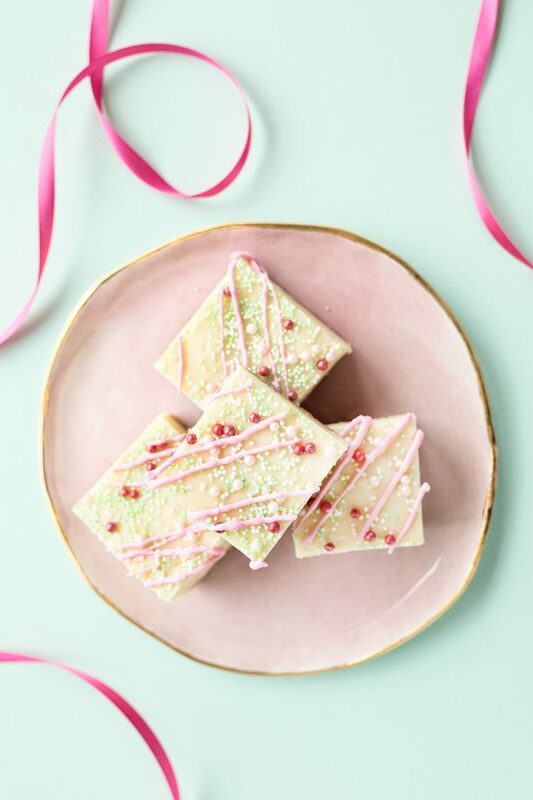 I’m popping in to talk about one of my favorite topics – dessert. 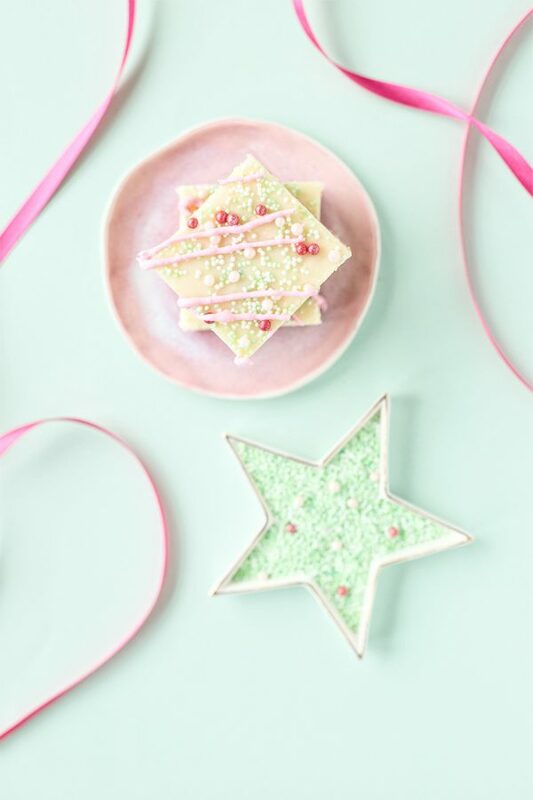 I mean, I love the trees, the stockings, the decking of the halls…but let’s be real, I’m all about those Christmas cookies. 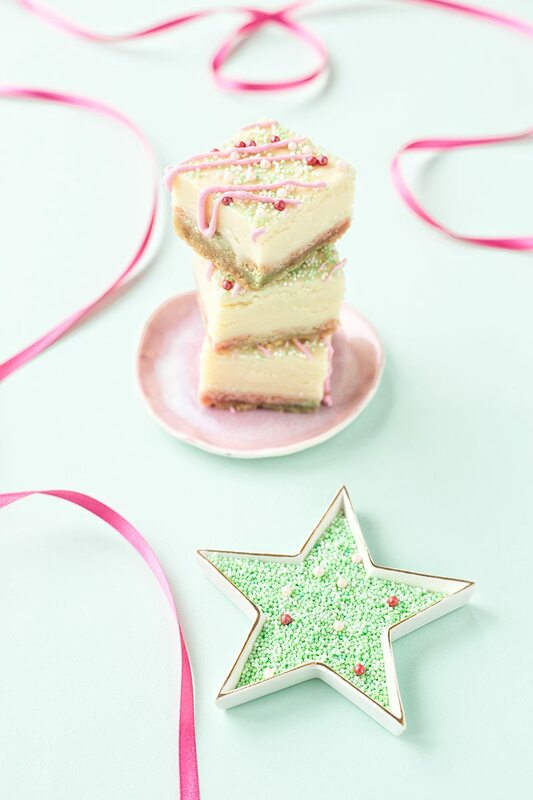 We thought it would be fun to do a little twist on the traditional holiday sugar cookie and fudge-i-fy it! 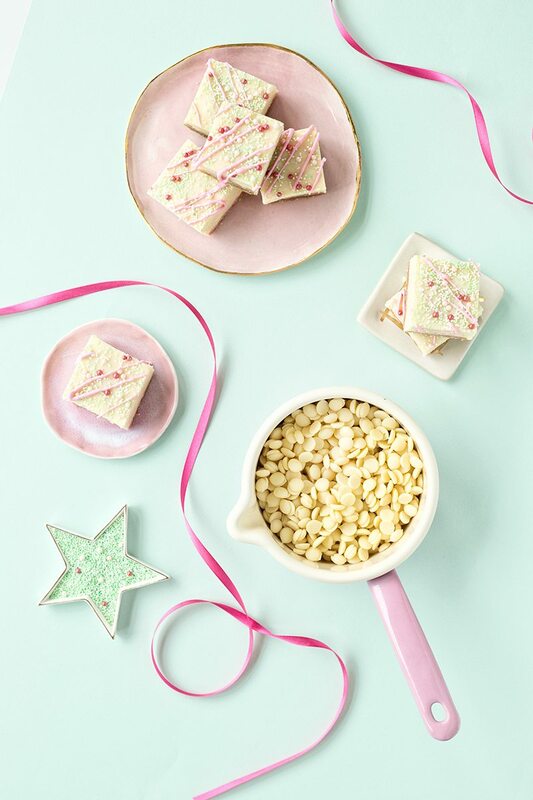 Because the only way to make Christmas cookies better is to make Christmas cookie fudge! Let’s do it. ‏Preheat oven to 350 degrees F.
‏Cream together the shortening, butter, and sugar until light and creamy. Add in the eggs and vanilla and mix until combined. ‏In a separate bowl, whisk together the flour, baking powder, and salt. Add to the butter mixture and mix until soft dough forms. Divide dough equally into 3 bowls. Leave one bowl white and color the other two thirds mint green and pale pink. ‏Bake in preheated oven for 20 to 30 minutes till lightly browned. ‏While the sugar cookie crust is baking. Place white chocolate in a double boiler and heat until melted and smooth. Add in the sweetened condensed milk and vanilla. Stir to combine. It will thicken up slightly. 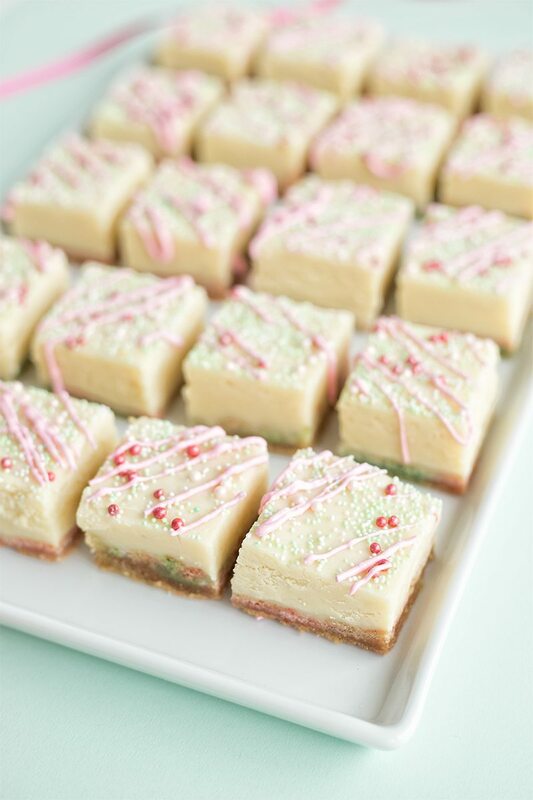 ‏Immediately pour white chocolate fudge mixture over the top of the cookie crust. Smooth the top with a rubber spatula and add sprinkles if desired. Let cool until set completely. Remove from baking dish. Melt candy melts according to package instructions and drizzle over fudge with a spoon, add more sprinkles if desired (duh!) and let set. Cut into squares. 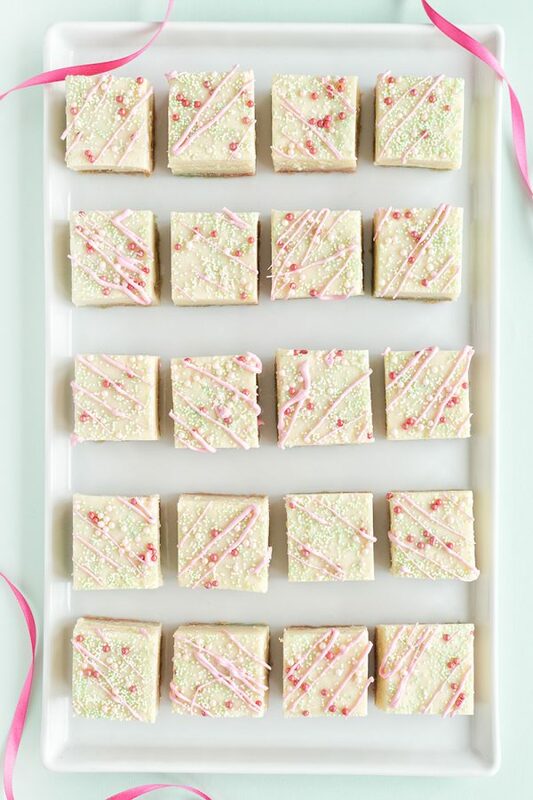 No doubt you’ll be the favorite at your cookie exchange if you show up with these! Thanks for letting me spread the sweet tooth love over here, TSO readers!